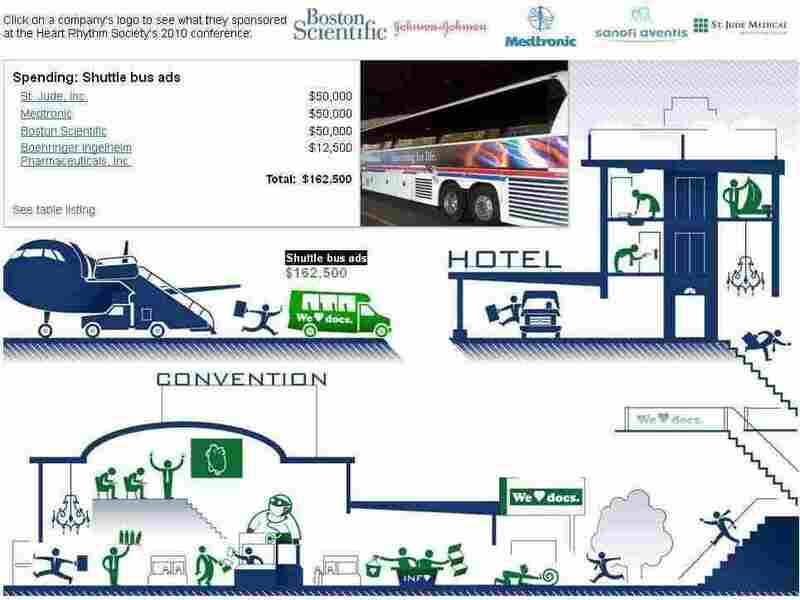 $162,500 For Ads On Shuttle Buses For Heart Doctors : Shots - Health News Last year, almost half of the $16 million collected by the Heart Rhythm Society came from makers of drugs and devices, ProPublica reports. More than $5 million in industry largesse came in the form of sponsorships and support of the group's big annual meeting. Click here to go to ProPublica's interactive graphic. If you stand still for very long at a big medical meeting, you run the risk of having a corporate logo getting slapped on your back. Just make sure you charge for the privilege. ProPublica's Charles Ornstein and Tracy Weber tally up the oodles of cash flowing from makers of drugs and devices to the Heart Rhythm Society, whose annual scientific meeting is in San Francisco this week. The group represents doctors who use all sorts of pricey gear, including implantable defibrillators and sophisticated catheters, to treat abnormal heart beats. And the makers of the stuff spare no expense in making themselves known. Last year, almost half of the $16 million collected by the Heart Rhythm Society came from makers of drugs and devices, ProPublica reports. More than $5 million in industry largesse came in the form of sponsorships and support of the group's big annual meeting. The heart society says it has procedures in place to prevent conflicts of interest. And, the group publicly discloses details about its funders, something most don't. For more on the society's response, see a ProPublica Q&A here. Click here go to a slick interactive graphic you can use to see how much various companies, including Johnson & Johnson and Medtronic, are spending on sponsorships.